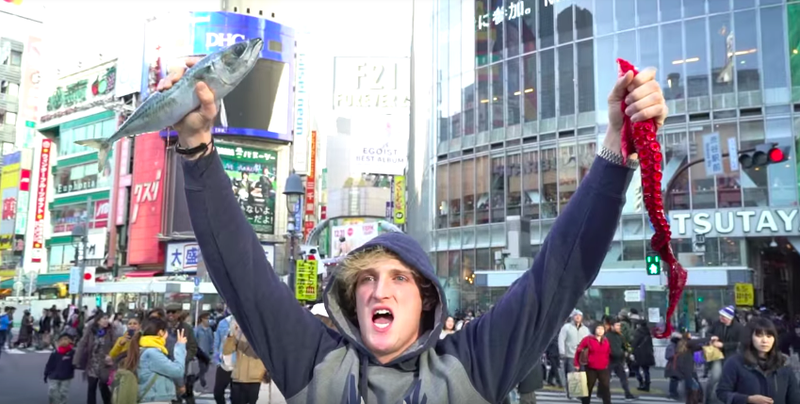 On January 1, the most important day on the Japanese calendar, when families gather and think about the new year, YouTuber Logan Paul posted an apparent suicide on YouTube. That wasn’t the only time he insulted the country’s cultural norms. He started doing that days earlier. On December 30, he uploaded a clip titled “We Fought In The Middle Of Tokyo!” In it, Paul goes around city as if its his personal playground. He does that in his other videos in the US, but this isn’t the US. It’s a city that he’s visiting in a country that has allowed him to enter. He probably should have stopped. The clip currently has 5.4 million views, nearly 250,000 likes and thirty-four thousand dislikes. As My Game News Flash, one of Japan’s biggest blogs, points out, the clip starts with Paul walking in the middle of the street, sticking his camera in people’s faces and in their cars. Japan has strict privacy laws about filming and photography, even in public places. That’s just the first of many cultural rules he breaks. But what does he care, right? He’s a maverick, and being oblivious to cultural norms or common courtesy and decency is the ultimate sign of being a maverick? Or something like that. He then rides on work vehicles. Keep in mind, the Tsukiji fish market has long had problems with misbehaving foreigners. Fellow mavericks, I guess! He stands in the middle of Shibuya with a dead fish and an octopus tentacle. He holds this dead fish and octopus tentacle against the window of a nearby Starbucks. Then carries the fish and the octopus into a clothing store. He looks at merchandise in the store, while again, carrying the dead fish and the tentacle. Then he leaves both on the back of a cab, which drives away. The Japanese word “meiwaku” (迷惑) appears throughout the comments. The word means “bother” or “annoyance.” As a general societal rule, Japanese people often do as much as they can not to bother or annoy other Japanese people. They do not want to create meiwaku for others. That’s all Paul is doing. But it’s more than that. It’s disrespectful. It’s as though Paul doesn’t realize he’s in a real city filled with real people. And against this background, Paul uploaded an apparent suicide to YouTube. He should’ve listened. He probably should’ve stopped. But he didn’t.